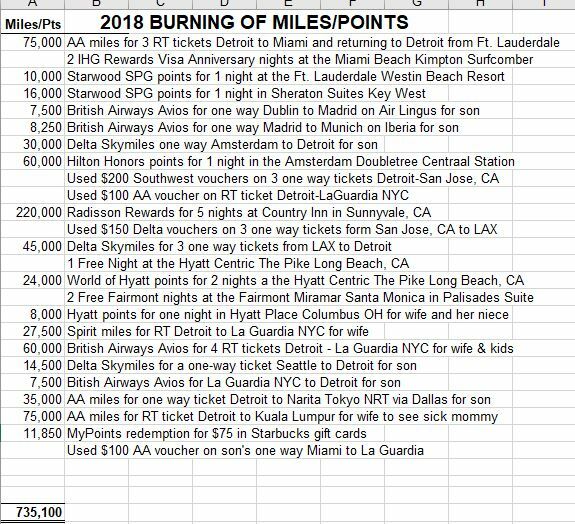 It is time for the annual post with all the ways I burned my stash of miles and points in the past year: How I Burned 735,100 Miles and Points in 2018. I am including some photos from the 2018 travel adventures. And some advice and feedback as always of course. I hope this inspires you to get out there and travel for freeeeeeeeeeeeeeeeeeeee! First, I think you should take a few minutes to read Mile Nerd‘s post on “The State of Miles and Points“. I think it is required reading. I appreciate the kind words to me and I apologize for driving him nuts! And I agree with his take on the state of the “hobby”. For the record, my blog does NOT link to the pimp blogs! And let me stop right there…as I contributed enough to the ranting culture 🙂 I also hope Doctor of Credit got the message…but the lure of the web traffic circle jerk is likely too much, sad! As you can see from the above, I have slowed way down. There are two main reasons for this. One is the incredibly tougher bank card approval environment as laid out in Mile Nerd’s post above. If it was not for now adult son’s credit availability…it would be even worse! Second is my travel patterns and aspirations have been completely disrupted. 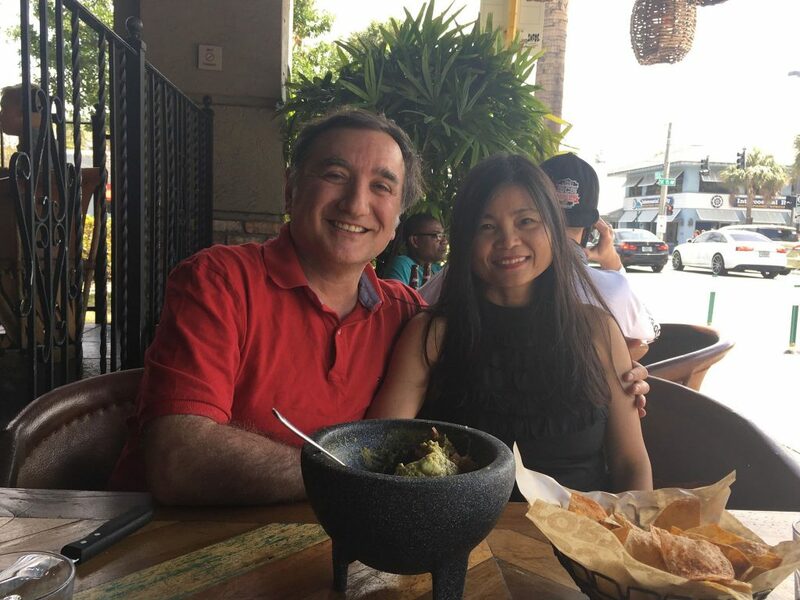 I am the poster boy for the sandwich generation having kids (one finishing college and one in High School) and an elderly mother living alone in Greece who needs attention and care. I do not have time to put together amazing trips like this anymore. I am basically on call and ready to fly back to Greece as soon as I get a call or urgent email telling me to hurry! On this front, we may have some developments as I managed to get my mother (as a trial period) to move in to one of the best retirement care communities and it appears she is digging it. Which is a HUGE peace of mind! So, as you can see, the rate of burn has slowed down and most is focused towards other family members. Son is developing a love for travel (but no affinity for this hobby at all, soooo sad!) and wife also has elderly parents back at her home country in Malaysia. We did get away with my wife and daughter to Florida over Spring Break, thank you AA miles. 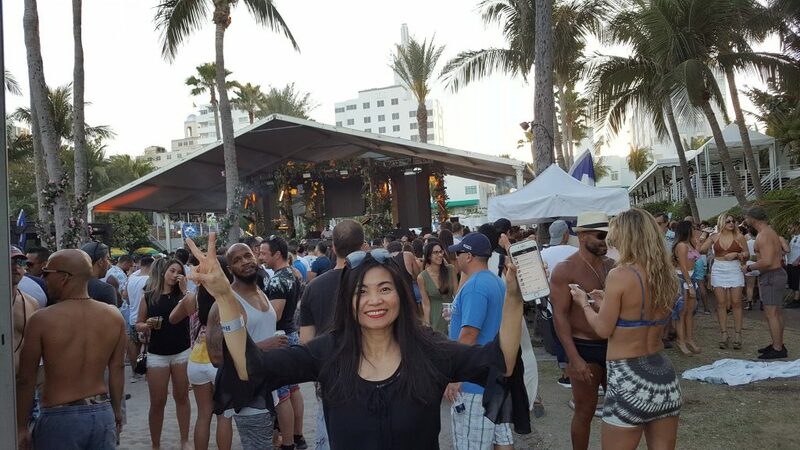 We burned 2 IHG Rewards nights at the Miami Beach Kimpton Surfcomber. Great location, great timing as it was during a music festival with a stage in the hotel. Other than that, this hotel sucked. Every Kimpton stay I have had has been disappointing, I am done with this wildly overrated brand imho. I crossed a bucket item off my list after doing the drive to Key West. We enjoyed one night at the Sheraton Suites Key West. We then moved on to the Ft. Lauderdale Westin Beach Resort. Do not come here over Spring Break! Done with this specific hotel too, it will only get worse now with the Marriott touch. Next time I will burn some Hilton points for the Conrad next to it. Son spent a semester last year studying in Madrid and he did lots of traveling all over Europe. And he reached out to his travel hacker dad when it made sense. And using British Airways Avios within Europe makes sense. Enter a few one way trips from and to Madrid. He paid his own way using low cost airlines for the rest of his trips within Europe. And I got him back to Detroit from Amsterdam, plenty of Delta Skymiles award availability on this route after spending his final night at the Amsterdam Doubletree which was extremely stingy in extending Hilton Gold benefits to him (I had to intervene through Twitter lol). Son spent most of the nights in hostels and Airbnb’s with friends. Millennials, they are changing everything! 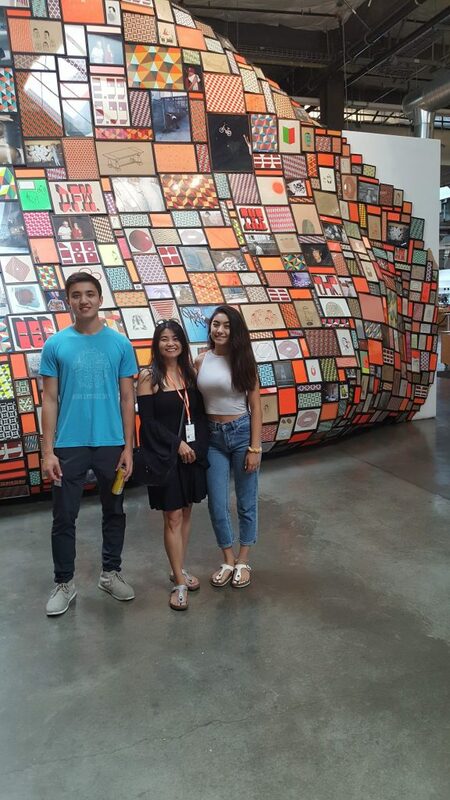 Then in August we went to the San Francisco Bay Area again to visit son who was an intern at Facebook. We got some cheap tickets on Southwest that became cheaper with a $200 voucher. We burned another set of Radisson Rewards points at the same Country Inn & Suites in Sunnyvale we stayed in 2016. I used another $150 voucher towards very reasonable cost tickets from San Jose to Los Angeles. 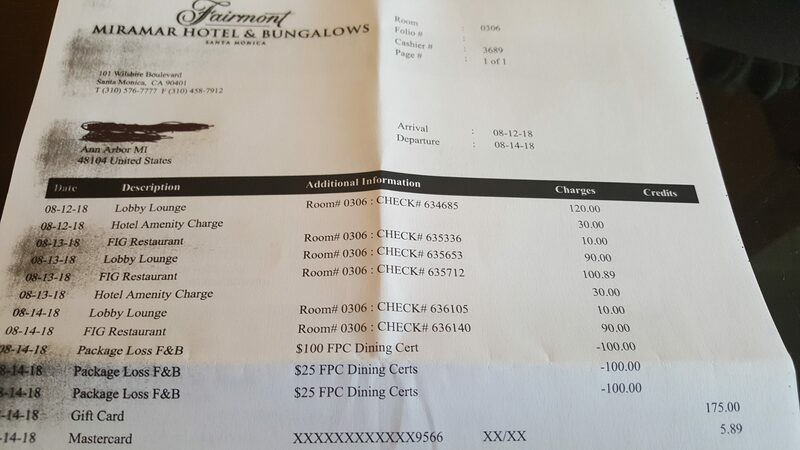 We stayed two nights for free at the Fairmont Miramar Santa Monica in a suite and managed to eat/drink our way through the stay and paying something like $5 on a folio showing $430 of food/drink. I am going to miss Fairmont Lifetime Platinum Presidents Club membership so much! I still have one free Fairmont night and another $100 to use towards food/drink! 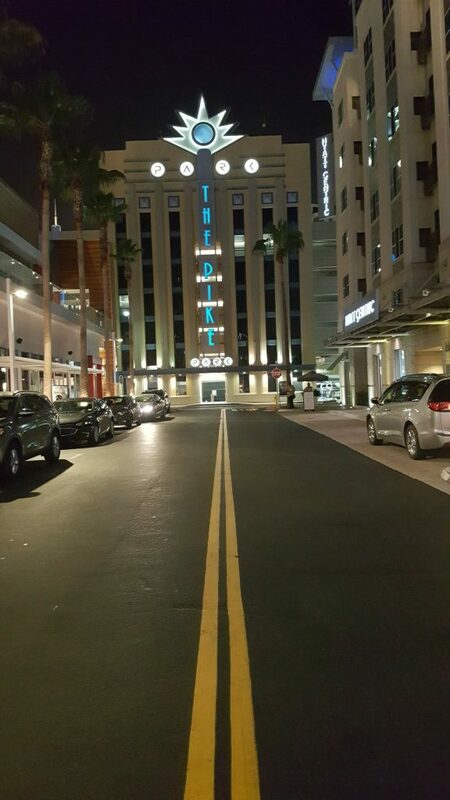 We then moved on to the Hyatt Centric The Pike at Long Beach for three free nights which we enjoyed. In retrospect, we should have stayed closer to LA, oh well. We burned 45k Delta Skymiles to return to Detroit from Los Angeles. We visited wife’s nephew in Columbus, Ohio. He is now studying at Ohio State. Out of all US colleges, why Ohio State, why? We stayed for free at the OSU Hyatt Place which is pretty standard. I burned some Spirit miles just before expiring (as I kept extending them doing dines) to send wife to New York where she has a brother and two cousins. And soon we will have our son move there in the Fall of 2019. I have spent British Airways Avios to fly on AA to New York numerous times. Enter another 4 tickets for us to spend the Christmas holidays there. Son visited Vancouver/Seattle area over Thanksgiving. I got him back from Seattle on Delta and he paid on his own for the rest when it made sense. Son visited Miami over New Year’s so he had to get back to Detroit later separately. Enter another British Airways burn for him to fly back on AA again. Son is going to do some major traveling in Asia after graduation this year. Enter dad to send him on a one way award ticket to Tokyo using AA miles. Developing. Mother in law developed some medical problems and wife wanted to go see her. Enter AA miles to Malaysia again. Flying back from Miami on January 2nd to New York is crazy expensive and no award availability at all. There goes another AA voucher to soften the hurt inflicted in son’s pockets. Miami Kimpton Surfcomber. Best part was the musical stage in it. We pretended we belonged in this crowd lol. I think she would look better with a CSP and AmexPlatinum in each hand, no? 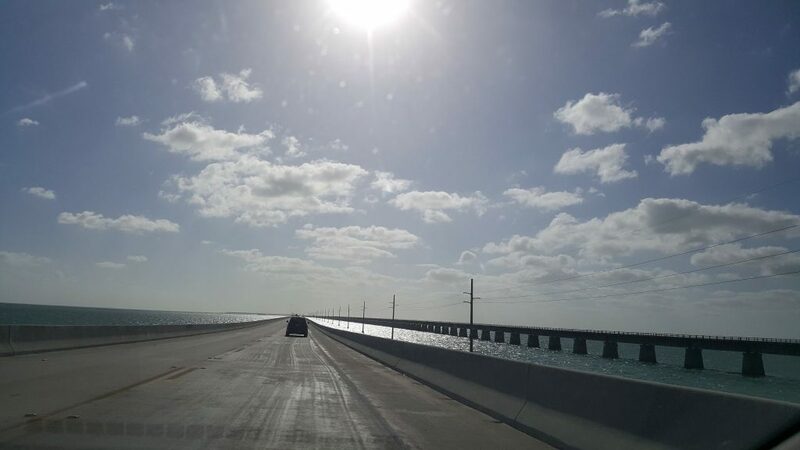 The Key West drive, done! Son gave us a tour of Facebook HQ. And we ate there as well. We ate…a lot lol! We loved the Indian food here! 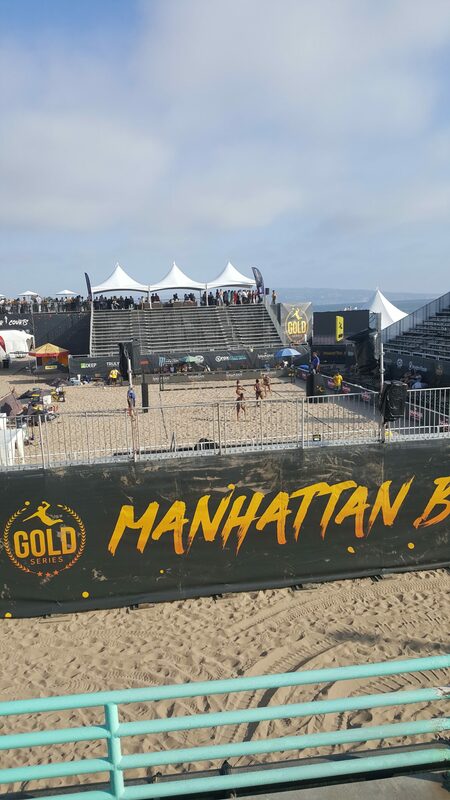 Watched beach volleyball for the first time. For free! 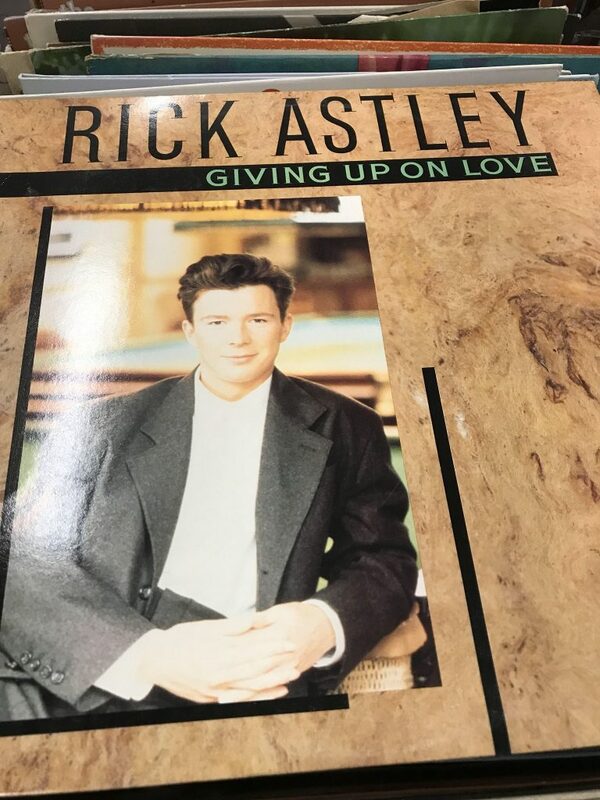 And I leave you with this…But you promised Rick! 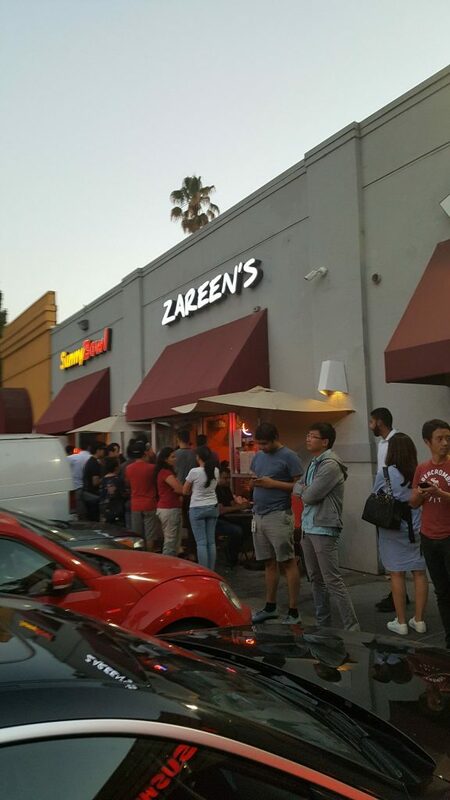 Zareen’s is also pretty good, I was there recently. Yeah, highly recommend, very authentic! Thank You Nancy and Chuck, the Wall is in the bag now. It is something we said? Congrats on being the last honest man standing! Thanks and lets see how long I last! Great example of how to use points and enjoy life! Plus, Claiming bronze! Actually, I found this burn list pretty embarrassing for my hacking standards…life has changed! Come on. He’s didnt get the “real” European experience. Travel by train, Interrail through Europe, sleep on beaches and Youth hostels. Youth hostels were great to meet new people in a new city. And drinking buddies. My favorite was the Youth hostel “jugendherberge landungsbrücken” in Hamburg. Right on Elbe and next to Reeperbahn. Perfect for enjoying the city at day and especially night. A sailors paradise. No wonder the Tropical Institute for Medicine is close by. He did some train riding, no beaches (winter semester) and most nights were at hostels yes. “Amazing tacos, forgot the name of the place”. Buzz on. And I think “daisy chain” is a more accurate description of the HT round robin, though using the words ‘circle’ and ‘jerk’ together does seem à propos. Still can’t remember the taco place name!! Can’t wait for the next back link from DoC to Gary, where readers would be pumped to oblivion. 25k amex gold card anyone? Maybe I missed something, but does your total for the year include when you burn (when they disappear from your account) or when you use (when you actually fly/stay in the hotel etc.) your points? I did struggle with this issue! I decided to just keep the list as I do the bookings. As in do the burn…as in miles/points disappearing from my accounts. Thanks! I’m going to tally up mine just out of curiosity. Oh, and after staying at the Kimpton DeWitt in Amsterdam, I agree with you about the brand. Yeah, I am done with them…Gotta give it to their web team, the Surfcomber pics make it look like Vendome or something…and they in no way correspond to real life! 23 new email list subscribers in one day????? Thanks for the Hyatt and Southwest conversions, u know who u are. The CNB card is not here yet. Come on! Big meeting in a few hours. Have plenty of material for Friday…just need to find time to put it together! 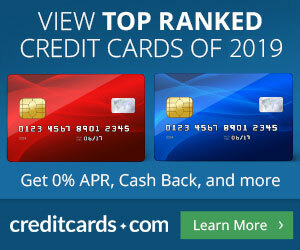 How do you plan to get Amex to honor the delta signup? I had the same thing happen to me where there was no pop up, I applied, was approved, met the min spend, then they didn’t honor the sign up bonus. Really looking for how to get the 60k miles. Not sure yet, waiting for the results of the investigation first. Maybe write to an exec. Or do cpfb complaint. Or both. Do you cull Mailchimp? A lot of signups will not receive mails due to corporate email policy. Once a month I do a Mailchimp search for people who have not opened an email in the last 3 months. They are then deleted. Most have a lifetime open rate of nil or close. Logged into Mailchimp once in the past few years when email stopped going out a few months ago. So, I need to get back into it again and figure out how to do what you mentio here which makes a lot of sense and get me back to the lower pay scale again. If someone has not opened an email in a long time…why bother? Thanks! You will then see who falls into this group and you can delete them. Only deleted 5. They are obviously not interested. Does Ben (OMAAT) have a hard time giving employees opportunities? Spencer was added in April and now he’s at GSTP. Few contributors have lasted more than a year. And they have rather few posts. Tiffany seems to be the exception. We’ll see…Lots of these guys write for several publications. And there is probably a bunch of ghosts writers doing most of what you read. Not here…I don’t even have an intern! James did not apply for the full time job I advertised so I guess he is happy. Free Southwest Companion Pass with just ine card?? ?